A father is a male parent. If he has children that are not his biological children (e.g. if the is the second husband of his wife, who remarried after her first husband died), he is called their stepfather. A father might also be called less formally Dad or even Daddy; though the latter is considered a very childish way of speaking. Another possible word is Pa, which once was common with "frontier" families in America, and Papa. In cases where there is a distinction, it's not uncommon for the distinction to be split in that Father refers to the male biological parent, but Dad refers to male who takes on the parental role in the child's upbringing. paternal (adjective) -characteristic of or befitting a father; fatherly: a kind and paternal reprimand. In Japanese based references, Otou-(san|sama), Otottsuan or Chichi refer to a father. Fathers play an important role in child spanking art because in the traditional hierarchy they are the highest authority of the family. Due to the fact that the father is usually also the physically strongest of the parents, most children fear chastisement by the father more than the same given by the mother. See also the phrase, "Wait till your father gets home". 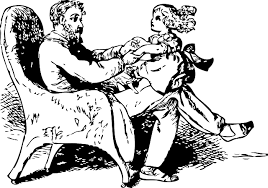 In spanking stories and visual arts, there are a lot of M/f and M/m works where the spanker is the girl's or boy's father. So far, the only real-life father/daughter spanking video that has surfaced is Father & Daughter (Amateur Spankings), in which 50-something Hank disciplines real-life adult daughter Brianna via hand, belt, and paddles. Below is a list of fictional father/daughter titles. Adriana’s Tales of Spanking Part 2 (Punished Brats), sisters caught smoking in "Up In Smoke". Spanking My Stepdaughter (Home Made Spanking Videos), father spanks real-life stepdaughter. This page was last edited on 22 September 2018, at 12:13.